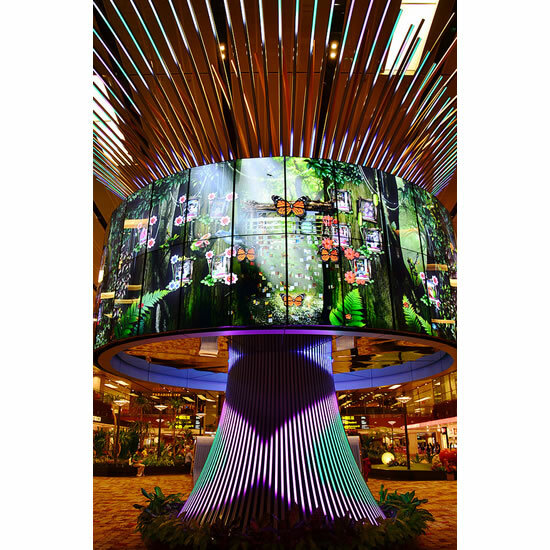 Changi Airport in partnership with LG, today unveiled the “Social Tree” in Changi Airport’s Terminal One. The towering 8.7m high, 11.1m wide larger-than-life installation sits at the heart of Terminal One at the Central Piazza and is designed to allow travelers arriving or passing through Singapore to easily and conveniently connect with friends and loved ones thousands of miles away. Symbolizing the global connections offered by the airport,which bagged the Skytrax 2013 World’s Best Airport award, the hi-tech installation is comprised of 64 47-inch LG 47WV30 displays in the form of a cylindrical video wall and eight kiosks where travelers canpost images and also share photographs and videos via Facebook and email.A password-protected account allows visitors to save images and videos in the Social Tree’s servers to be retrieved at a later date. Every day, Changi Airport connects thousands of passengers to over 240 cities in some 60 countries and territories around the world. Embracing this concept, the Social Tree was designed for travelers to capture photos and video via built-in cameras located in the kiosks to be shared with friends and families in any country. 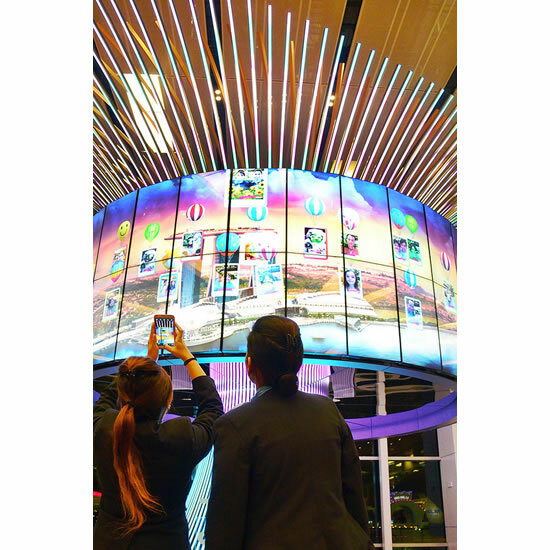 Travelers’photos can also be posted to the cylindrical video wall and layered over images of Singapore’s skyline, aquarium, forests, city streets and high-tech buildings, for travelers to leave a record of their time in Singapore. LG’s cutting-edge displays that form the “trunk” of the Social Tree employ IPS display technology, providing exceptionally vivid colors and crisp picture quality. The IPS panels offer a 178-degree viewing angle for a clear view of the video wall from almost any angle. The thin 6.3mm bezel around each display minimizes the gap between panels while the advanced auto calibration software maintains consistent color and brightness. Additionally, the video wall consumes relatively little energy, making it both environmentally friendly as well as cost efficient. 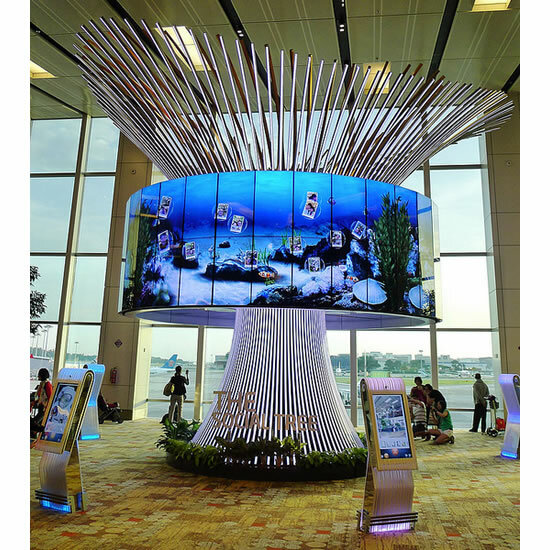 The Social Tree is the latest enhancement to the Changi Experience and the result of CAG’s efforts to continually improve Changi Airport’s award-winning amenities and facilities. It follows the upgrading of Terminal 1 last year which saw the installation of the mesmerising Kinetic Rain sculpture, in the Departure Hall.